A couple of months ago I gave up drinking caffeinated coffee and tea. And I haven’t looked back. I still drink decaf coffee and tea though and they taste great. I feel so much better for it. Eeeeeeewwwww, why bother? I can hear coffee aficionados gasp. Well, I worked out it was the ritual of a cuppa I loved, not the caffeine buzz. And after a bit of research I’ve found some awesome decaf blends that taste delicious. Try your local loose tea shops and coffee suppliers for some great blends. I even travel with my own tea bags and coffee if I know there are not going to be any hipster coffee shops nearby to satisfy my tastes. Trust me, there are certain places you should never order a decaf, probably the same places that make a dodgy coffee. It’s all common sense really. Why I gave up coffee? I’d turned into a person who was being impacted by coffee. I turned into a middle aged woman – when did that even happen? I was getting a racy heart. I was finding it hard to sleep. I was needing more and more coffee to get through each day. I was tired. I was anxious and felt rushed all of the time. I decided I’d do a little experiment and see what would happen if I cut out caffeine. The first week was hard going. I had headaches, broken sleep and felt even more tired than usual. I was so tempted to just give in and have a coffee or four. When my headache was unbearable I did have a short black which helped, but that was it. Slowly, things improved. My racy heart has stopped being racy, completely. Now it only gets a bit thumpy if I have too much to drink, so it looks like I might have to tackle that in the New Year. I sleep so much better now. I hardly toss and turn and when I wake up I feel refreshed, not sluggish. And my brain feels clearer as a result. Do I still have caffeine occasionally? Generally, I don’t. If we run out decaf beans or if I’m flying and need a cup of tea, I will drink caffeinated drinks. The only time I have caffeine is when I eat coffee gelato and chocolate coated coffee beans – if they had decaf versions I’d chose them instead, but they don’t. They’re only an occasional indulgence anyway. One day I’ll make my own decaf options. Has my world fallen apart? No. I find that mostly it’s other people who drink coffee who have the biggest problem with people like me drinking decaf. I have no idea why? It’s not impacting on their world. For me, it’s a lifestyle choice and one which has made marked improvements on my health and wellbeing. And I still get to cradle a lovely hot mug of decaf in the morning and plan out my day in my head. The ritual remains. Have you ever made a lifestyle change which had positive results? I’ve not given them up – among other reasons, my mid morning coffee is what slices through the fog of my pain meds (aggressive RA, so no option on taking them…). What I DID do though, was stop making it at home. I have a few good places where I go, it gets me out of the house – had to stop working due to the disease – and because I have to fork out for it, I don’t go berserk, and it’s generally just that one coffee mid morning. I drink a black Chinese tea (still getting that from a Perfect Cup at the Adelaide Central Market – they post it to me in Sydney, bless them!) to start my day, a bucket or two of that, and it’s rare that I make more through the day. 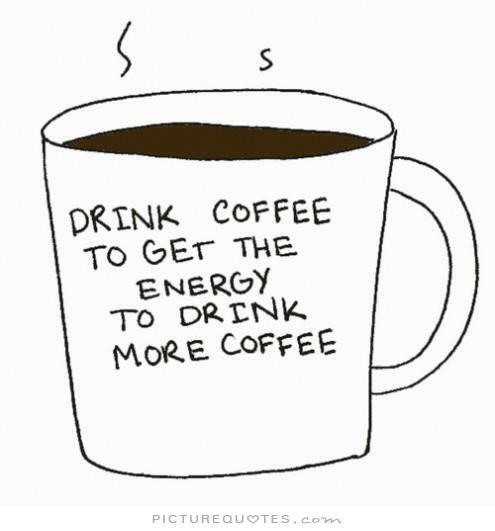 So, I figure I’ve got my caffeine intake as minimal as it’s going to get! I have one coffee most days, usually around morning tea time. Tea in the morning – probably two cups, and that is that. I can understand cutting it out if you are affected by the caffeine. I don’t get the decaf thing but then again, I’ve never really had a thing about coffee either! Enjoy feeling better with that change to your style!! Wow this is really interesting. You sound like you are describing me! Perhaps I should try quitting too… What brand of decaf do you recommend for making coffee at home? A long time ago I worked on a minesite, fly-in/fly-out. In my office, my alternate worker and I had a coffee machine that we kept going all the time for the social aspect really. That lifestyle is very lonely. Anyway, my social experiment for one swing (aka roster) was to fill the coffee machine for the entire time with Decaf. I had done my research and used a good decaf, not one chemically washed with bleach etc. Not one person noticed. At the end I told a few people, my senior was really angry – and I don’t know why. Noone noticed a single thing. We all still drank coffee from sparrow fart o’clock in the morning, chatted, worked and laughed. Im going to give the decaf a trial. Thanks Bianca for reminding me of this past memory, and giving me hope that it wont be too horrendous giving up.